When the weather warms in the spring many people begin dreaming of lazy afternoons by the pool. But before you can enjoy fun in the water and sun, you will need to give your pool a good spring cleaning to make sure it clean and healthy for swimming. With a little effort you can complete the task in about a week and will soon be enjoying your pool on a daily basis. Follow these guidelines for getting your pool ready in the spring. 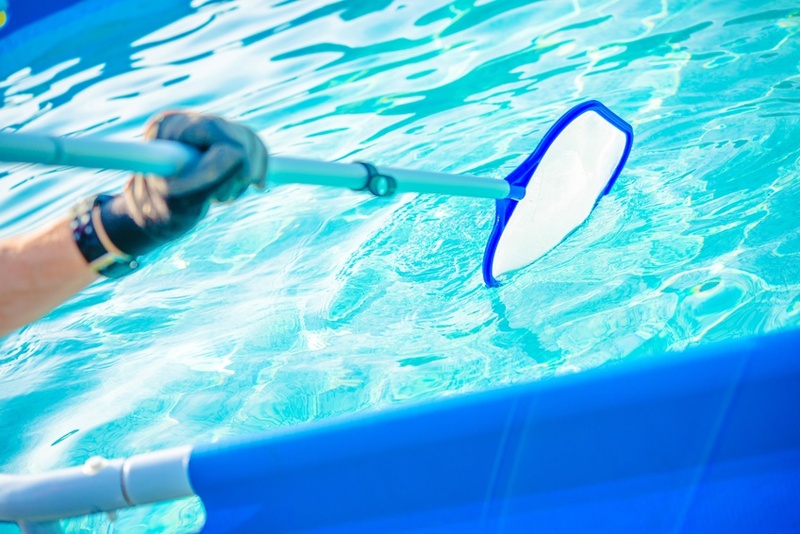 Before you open and clean your pool for the season, take the time to clean the area around the pool. This means trimming branches and cutting back shrubs that have grown a bit too close to the pool, as well as sweeping and cleaning up fall and winter debris that has found its way into the nooks and crannies around the pool. Use a rake to remove old leaves or mulch that has collected under bushes around the pool. You winter pool cover has done its job by keeping leaves and other fallen debris out of the pool while it sits idle, but it didn’t make it magically disappear. Chances are your pool cover is covered with plant material, like fallen leaves, cones or small twigs. Sweep the top of the cover clean to remove any foreign objects. Once the cover is bare, grab your hose and spray it down to remove soil or other loose material that you may have missed. If the pool cover has water on it, use a sump pump to remove it. While some people prefer to remove the pool cover before they begin working on the water in the pool, leaving it in place will prevent new leaves and debris from getting into the pool while you are waiting for the water to be ready. Either way, you have work to do to get the inside of your pool ready for swimming. Put the filtration system together, clean all baskets and filters, and remove any plugs you put in when you closed up the pool. Use a chemical open kit or one labeled for spring start up to adjust the chemical and pH levels in your pool. Start the filtration system and let it run until the water in your pool is clear. This may take up to a week, depending on the size and condition of your pool. Clean the filter everyday until the water remains clear. When the water is clear it is time to move on to cleaning the interior of the pool. Remove the pool cover at this time, if you haven’t done so already. Vacuum leaves and debris from the bottom of the pool and scrub the bottom and inner walls with a scrub brush designed for use in your pool. This will remove any traces of algae or other debris and get your pool sparkling clean. Allow the system to run for another 24 hours to filter out any particles you may have released into the water while cleaning. Some people prefer to clean the interior of the pool before beginning to work on the water. This often allows them to remove visible debris and have the water tested by a professional before adding chemicals. The theory is that testing the water lets you know exactly which chemicals you need and eliminates wasting your time and money on chemicals you don’t really need. Do not drain the pool to clean it. Sometimes, homeowners mistakenly think that draining the pool to clean it is the best way to go. But the truth is, if you have an in-ground pool, draining it can cause the bottom of the pool to be heaved upward. This typically happens if the ground water level is high. Because the pool is empty it does not have the weight of the water to keep the bottom stable. To learn more about taking care of your pool, visit our blog or contact us to arrange for our experts to come to your home and open your pool for you. We offer pool maintenance services on month-to-month basis and can handle all your cleaning and repairs while you kick back and enjoy the sun.